Sean Dyche accepts he won’t always be able to keep an incredibly competitive group of goalkeepers happy. But he is enjoying the challenge of boasting three of the last five keepers to be capped by England at the club. Joe Hart signed last week from Manchester City, and the 75-cap England man has played the last two games, in Istanbul and at Southampton, keeping two clean sheets. Nick Pope is out of action for the foreseeable future after a dislocated shoulder, while Tom Heaton, who also suffered a dislocated shoulder last September, is close to full fitness after a niggly calf problem. Heaton was on the bench at St Mary’s, and when he is fully fit, the club captain will hope to regain the number one spot he held from signing in the summer of 2013. Throw in Anders Lindegaard and Adam Legzdins, and the goalkeeping group is remarkable healthy, but Dyche knows the time will come when he will have to disappoint someone. 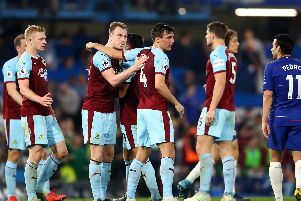 Asked how he will keep them all happy, Dyche said: “It’s easier at the moment, because common sense applies, injuries, fitness, game ready. And Dyche doesn’t understand the reaction in some quarters to bringing Hart in, on top of the options he already had: “The kind of situation as it came around with the injuries we had in the goalkeeping department, I think it’s been quite interesting the debate on it. Well, I can’t work out the debate at all myself. “It’s pretty simplistic. Random injury to Nick Pope, one last year to Tom started off this bigger, longer process. “Random injury to Popey, Anders goes down with a thigh, Tom Heaton has got a calf, so it’s not rocket science all the time, you know? “I think probably the only difference is that we signed Joe and it wasn’t a loan type period. He added: “If you went on business, with his background, at 31, you’ve got to think he’s in a good place to be. “He’s in a school of good goalkeepers with good demand, at a club that is slightly under the radar and he can get on with his football. “In my world it’s looks like good business. And Dyche insists there is no number one in his mind, it is down to the keepers themselves to earn the shirt: “It’s up to them. You can debate all different goalies, all very good for different reasons, play well, keep the shirt, they’re the rules. “Tom’s been really unfortunate with the timing. Popey got injured then he wasn’t available for the Europa games, then it’s three weeks to recover, then it’s five days training in three weeks and only the 45 minutes at Preston.